but encounter my opaque confinement. make ghostlike strangers of my surroundings. I confuse what is and what might well be. I will not dread the unfamiliar. nor will I believe the apparitions. so, opened eyed, I anticipate light. I become godparent to a new birth. Program Notes: In 2000, Victoria Mushkatkol, a wonderful teacher on the Pre-College piano faculty, asked me to write a work for her faculty recital. 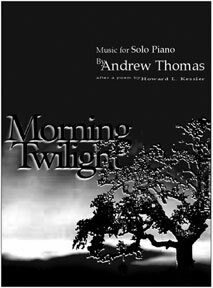 I was deeply honored by her request, and on thinking about the project, considered writing a companion piece to an earlier piano work of mine, Music at Twilight. My partner, Howard Kessler pointed out that work was an evening piece, and that the word twilight also referred to the early morning hours. He wrote me a beautiful poem describing a venturing out into the first gray glimmers of light at dawn, the strange ill-defined and shifting shapes, and the first stirring of birds. This became the framework for the music, which is very quiet, and which utilizes silently depressed keys to release mysterious harmonics in other regions of the piano. Victoria gave a masterly and evocative premiere of the work in 2001, and on my 65th birthday recital on Saturday October 9, 1904 in the Juilliard Theater I had my own first performance of Morning Twilight.